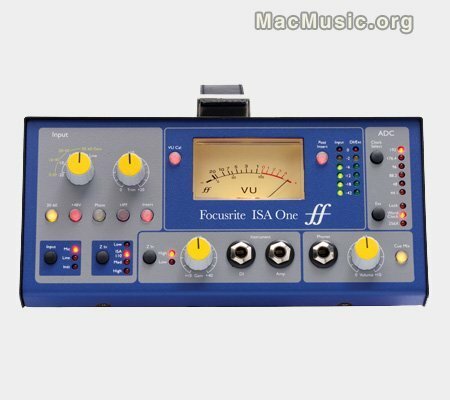 Focusrite has announced the ISA One Digital, a version of the ISA One mic preamp/DI that ships as standard with on-board analogue-to-digital conversion. Thanks to its independent mic pre and DI signal paths and, with its 192kHz digital outputs, it can transform any audio interface with a digital input into a truly professional DAW front end. The ADC board — which was previously an optional extra for the analogue-only ISA One — provides AES/EBU, S/PDIF and SMUX-compliant ADAT outputs for the unit, with the preamp and DI signals streamed separately over the two channels of the digital connection. With studio-grade A-D conversion and jitter-elimination technology, and a 118dB dynamic range, this direct digital link bypasses the analogue circuitry and converters in your existing audio interface, providing a high-end signal path straight into any music-recording software. The ISA One Digital's mic pre features Focusrite's classic Transformer-based circuitry, giving you the sound made famous by the Forte console in your home or project studio. The preamp's switchable impedance includes an ISA 110 setting, to accurately emulate the classic Focusrite front end, and there's a dedicated insert point, to add further processing into the signal chain. The unit also features a headphone output with a stereo cue mix input — so you can monitor signals from your DAW — and comprehensive metering provides accurate visual feedback. The ISA One Digital will be available at a price of $799.99/€699.99. The standard analogue-only ISA One will remain on sale in stores worldwide, at a new lower price of $499.99/€449.99.